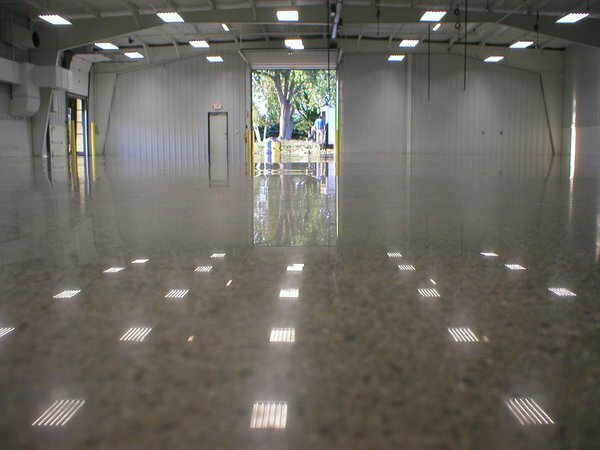 Polished concrete is the process of grinding the surface with a heavy, high torque machine with varying levels of coarse to fine diamond blades. The machines used are accompanied by a high horsepower, dustless vacuum system. This system creates a clean, non hazardous, environmentally friendly process. The result is a strong, decorative easy to clean, low maintenance floor. Efflorescence Reduction – The process of grinding, densifying and polishing the surface eliminates dust from efflorescence that causes many epoxies and coatings to fail. Non Porous – the process of densifying and polishing tightens the molecular structure of concrete. This reduces porosity protecting the surface from water, oil , chemicals, grease and heat. Strength Increased – densification increases strength and long term performance. Enhanced Light Reflection – tightening molecules in concrete causes light to reflect off surface. Color Enhancement – reflection brings wall colors into surface enhancing decorative appearance. Non Slip – Coefficient of Friction exceeds OSHA recommended guidelines. Return To Service Immediately – there is no need to wait to use. Floors can be used as soon as complete. 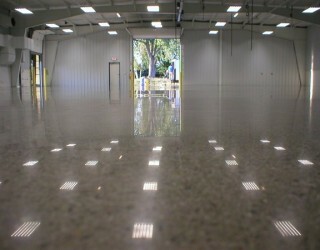 Environmentally Friendly – Polished concrete is LEED friendly. There are no VOC’s. We use Husqvarna concrete polishing and grinding equipment which is recognized as the highest performing in the industry. The process starts with grinding the concrete with coarse diamond blades. The floor is ground and polished with successively finer blades. Midway through the process a liquid densifyer is applied to the floor. This tightens the molecules in the concrete surface. The subsequent levels of polish produce the shine which can range from a matte finish to high gloss. Abrasive grinding can expose the aggregate in the concrete producing a terrazzo like result. Additionally the floor can be dyed in your choice of color with shine options ranging from matte to high gloss. Saw cuts can create the look of tile in any size. Custom engraving and graphics can create a unique, one of a kind floor.